Hebrew poet; born at Minsk, Russia, 1845. He studied Talmud under Rabbi Ḥayyim Selig and other prominent rabbis. At the age of sixteen he read through the entire Talmud. He was then married tothe daughter of a Ḥasid; and under the influence of his new surroundings he began the study of the Zohar and other mystical literature. In 1868 he went to Kiev as teacher in the house of Lazar Brodski, where he studied German and Russian. He was also made treasurer of the Brodski flour-mills. In 1887 he was appointed treasurer of the Brodski sugar-refinery in Tomashpol, Podolia, where he is now (1904) residing. 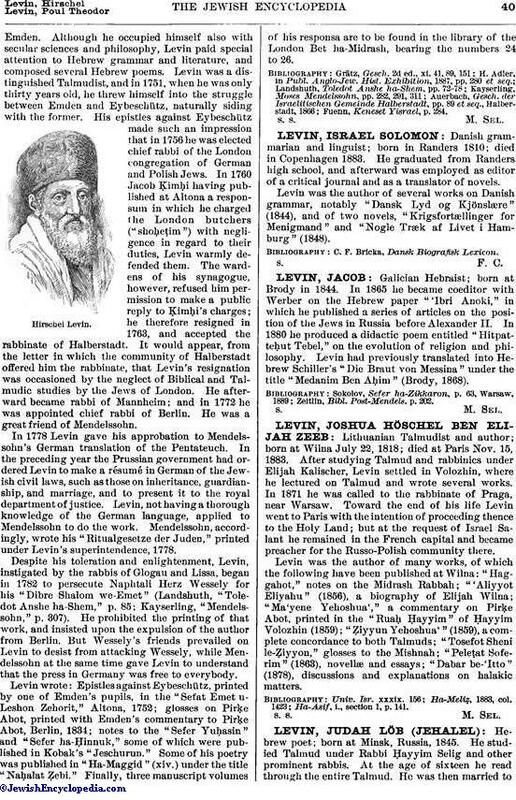 Levin began to write Hebrew poetry at the age of ten; and he has contributed extensively during the last thirty years to the Hebrew periodicals "Ha-Meliẓ," "Ha-Ẓefirah," "Ha-Maggid," "Ha-Asif," and "Ha-Shaḥar." His first collection of verse, entitled "Sifte Renanim" (Jitomir, 1871), contains mostly occasional poems. In 1877 his "Kishron ha-Ma'aseh" appeared, first in "Ha-Shaḥar" (vols. vii., xviii. ), and then in book form. It contains four large poems throwing light on the social condition of the Jews of Russia. They are socialistic in tendency. In another volume of "Ha-Shaḥar" (lxxx.) he published "Elḥanan," an epic poem in three parts, also concerning the social condition of the Russian Jews. 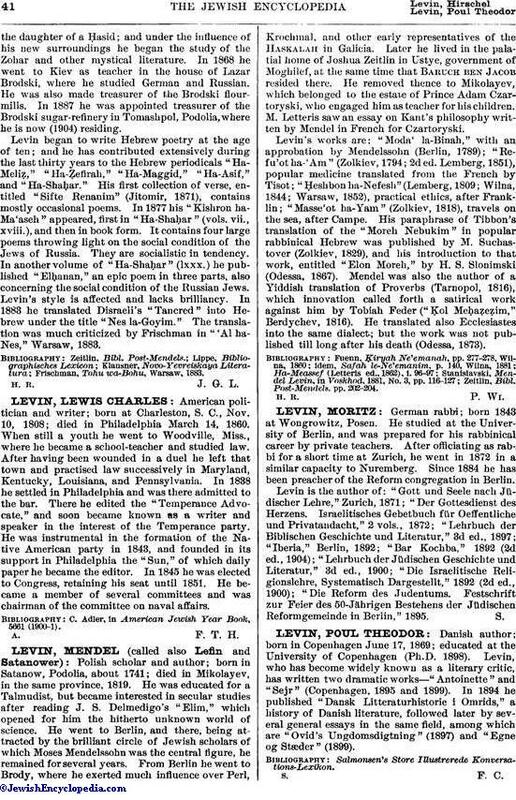 Levin's style is affected and lacks brilliancy. In 1883 he translated Disraeli's "Tancred" into Hebrew under the title "Nes la-Goyim." The translation was much criticized by Frischman in "'Al ha-Nes," Warsaw, 1883. Frischman, Tohu wa-Bohu, Warsaw, 1883.